The 1KTGOLD® alloy is patented worldwide. From the leading specialists for trendy tennis bracelets: Tennis Star®. With real, coloured topaz gemstones. But still remarkably affordable. The delicate band made of tear-resistant fibres from real mooring rope focuses on the trend of fine cord bracelets. The colourful, sparkling topazes are contemporary, and therefore an affordable alternative to the precious diamonds of the legendary original from the 30s. This special alloy with 4.16% gold content is considered “The gold of the new generation” – the fine but affordable introduction into the world of tennis bracelets. Strong enough to hold the gemstones securely in the long term, also protects from tarnishing and discolouration, allergy and nickel-free. Freely moveable among each other, 20 gemstones (0.80 ct total) fall in line perfectly on the supple band. It has a snap hook fastener, measures 2.7mm (0.1″) wide and is adjustable in length from 15 (5.9″) to 19.5cm (7.7″). The tennis bracelet: born in the 30s, “baptised” in 1987. High society ladies wore precious diamond bracelets as early as the 30s that twinkled in the sun during elite tennis games. Because of their flowing nature, they were called “rivière” bracelets after the French word for river. 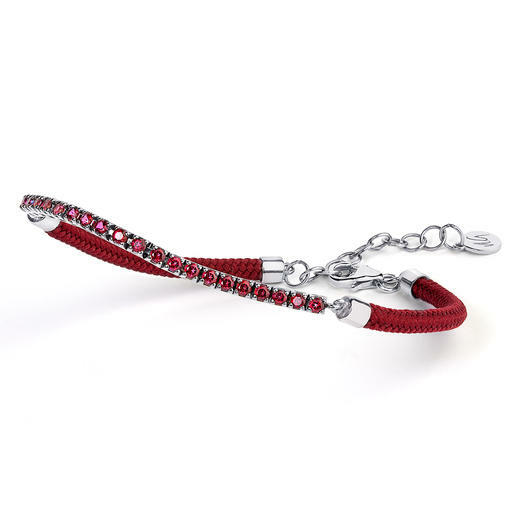 The top-class piece of jewellery became known as a “tennis bracelet” during a match of the US Open in 1987: A player lost her custom-made rivière bracelet and asked the referee to stop the game that was being broadcast worldwide in order to search for it.